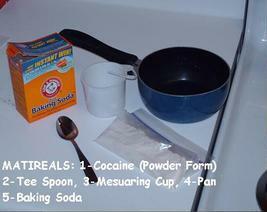 February 21, 2007 By John P.
As a follow up to my previous post regarding the manufacture of cocaine, I came across the attached image documenting the process of transforming normal cocaine to crack cocaine. The criminals already know how to make crack cocaine. It is only the law abiding citizens that wonder what it is. The manufacture of crack cocaine requires that one already possess cocaine. These instructions won’t hurt anyone that doesn’t already have a serious issue on their hands. The information already exists on the Internet. 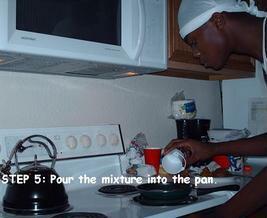 Materials Required: Cocaine powder, teaspoon, measuring cup, pan, baking soda. 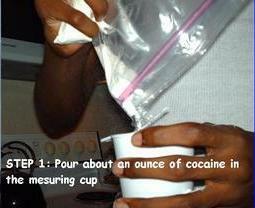 Pour about an ounce of cocaine in the measuring cup. 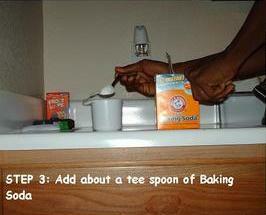 Add about a teaspoon of baking soda. 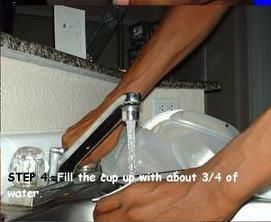 Fill with about 3/4 cup of water. The mixture will start to bubble. 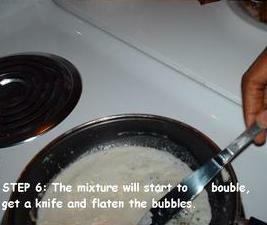 Get a knife and flatten the bubbles. 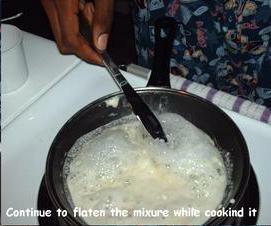 Continue to flatten the mixture while cooking it. 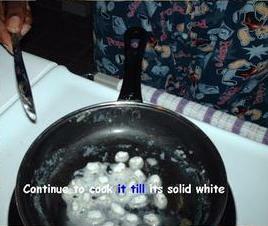 Continue to cook it until it is solid white. 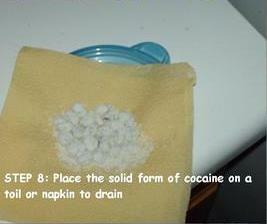 Place the solid form of cocaine on a towel or napkin to drain. 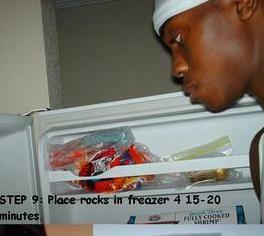 Place crack rocks in freezer for 15-20 minutes. 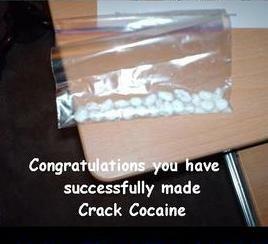 Congratulations you have successfully made crack cocaine. 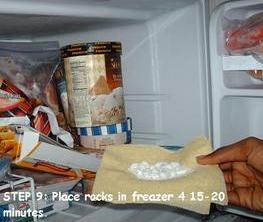 If you are here because you are curious about how people make crack cocaine, now you know! And if you are here because you actually want to do it yourself – get help. And I don’t mean getting help making the crack cocaine. Get help with yourself. Crack hit the Marcy Project, in Brooklyn, back in mid 1980’s. I read an interesting book that deals with the residents who were addicted to it. There is a very famous rapper mentioned in the book as well who was a crack dealer. The book showed how he made money from it and who he killed in the process. The book Is called Escape From Marcy.